It was nice seeing you today. How is your hand? I too was surprised when my teeth cut through your gloves. Looks like I'm stronger than I thought. Rest assured that I am up to date on my shots. 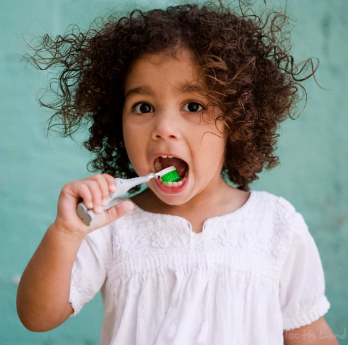 Tooth decay is one of the most common childhood diseases, even more common than asthma. It has been reported by The Centers for Disease Control and Prevention that one in seven preschoolers and toddlers between 3-5 years old has untreated tooth decay. It's considered a disease because cavities are caused by bacteria that use sugar in a child's diet to produce acids that destroy the teeth. When the permanent teeth eventually come through, they will also be infected with the bacteria from the decay in the baby teeth, so it’s important to keep preschoolers baby teeth free from decay. Limit high carbohydrate snacks such as pretzels, cereal and crackers that break down into sugar in the body. Juice is a huge culprit. Juice bathes the teeth in sugar. Water is a far better alternative for toddlers to sip on. Brush twice a day. Helping toddlers to get to each tooth is a helpful activity as they tend to only brush the front ones. Limit the amount of candy that your preschooler consumes daily. Try to visit a pediatric dentist a few times just for check ups and cleaning and this way your preschooler will not be that unfamiliar with the whole process. Try to withhold your fear as preschoolers are very quick to pick up on parents anxiety. These are just a few tips to help keep your preschooler's teeth cavity free. Please chat to your pediatric dentist if you may have any concerns or questions about your little ones teeth.